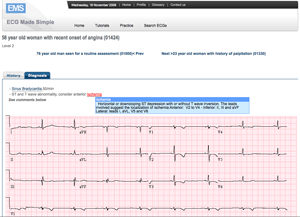 ECG Made Simple (EMS) is a comprehensive web-based ECG learning program that teaches the art and science of electrocardiogram (ECG) interpretation. It addresses the needs of various groups of learners, including medical students, post-graduate medical trainees, and practicing physicians who need a refresher. The ECG Made Simple tutorials utilize animations extensively to illustrate the often difficult to explain time-based concepts inherent in ECG understanding. The practice section is populated with ECG tracings of increasing level of difficulty (5 levels). The ECGs could be accessed through the practice lists or by using the “Search Module”, which allows users to search for specific ECGs based on the diagnosis and level of difficulty. 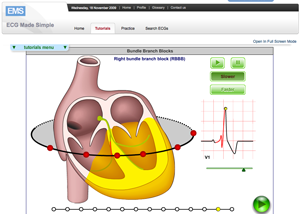 Register now and gain instant access to all tutorials, practice ECGs and other features.